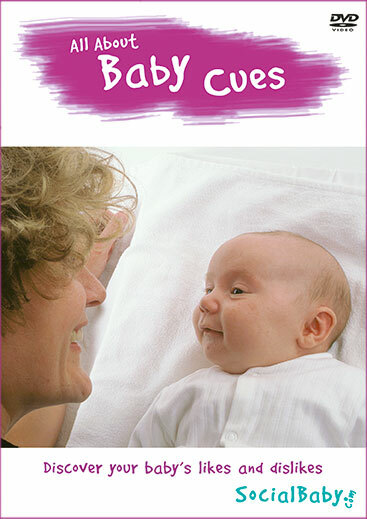 This resource pack promotes baby-centred care. 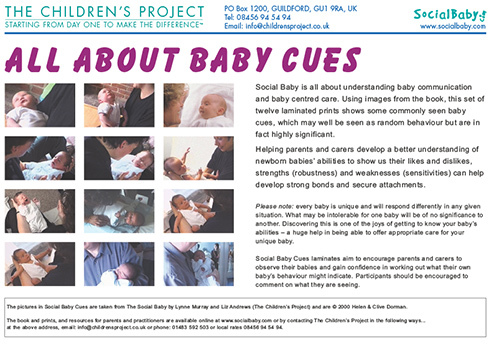 It uses images from The Social Baby book to show the subtleties and significance of infant behaviour and is specially created for small group work. The book is spiral bound. An image faces the group whilst text helps the facilitator talk about the picture and encourage discussion. Each page has thumbnail pictures of the image being shown, and the next one. A range of topics are covered (see below). All About Baby Cues encourages parents and carers to observe their babies and and aims to help them see everything a baby does as a form of communication. This can be an empowering experience. It should always be made clear that babies are unique individuals and their responses to different situations will vary greatly. What will be challenging for one baby will be easily tolerated by another. This is the fun of getting to know your baby - and of course helps to develop strong bonds and secure attachments.